Water protectors were injured on Sunday night, so Anonymous had to in turn inflict harm on the grenade providers. What occurred on Sunday night at the Standing Rock Indian Reservation was a brutal use of force that showed the true colors of the oil companies backing the Dakota Access Pipeline and local police. It’s been clear which side the police have been on from the start, but up until now the assault on protesters has been relatively mild and spread out. However, on Sunday night, chaos ensued when law enforcement pulled out all the stops in an effort to persuade the protesters to end their fight. Police used rubber bullets, water cannons, and concussion grenades to cause “nonlethal harm” to the water protectors, but the damage inflicted was massive. Police reportedly shot a 13-year-old girl in the face with rubber bullets, vindictively shot a man at point blank range in the belly button and knee caps with a smile on their face, and caused two elderly tribe members to go into cardiac arrest. They used water cannons to hose down the protesters trying to move past a barricaded bridge and many of them were sent to the hospital for hypothermia because of the subfreezing temperatures. Concussion grenades are nonlethal explosives that stun victims and leave them without their senses temporarily as it releases a blinding flash of light accompanied by a piercing bang. Though local police deny using them during this attack, evidence of their use has been brought forward by one woman who was critically injured by one. A 21-year-old woman was hit directly in the arm with one, which caused “all of the muscle and soft tissue between her elbow and wrist [to be] blown away,” her father lamented. If her multiple surgeries don’t go away, she will need to have her arm amputated. 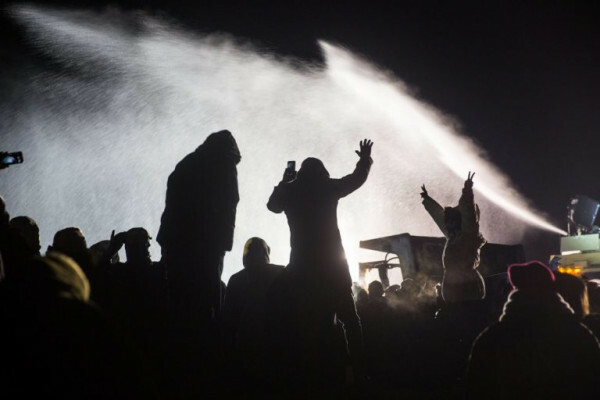 Notorious hacktivists Anonymous came forward to aid in the fight against DAPL police by knocking Safariland offline, the website that supplies local law enforcement with tear gas, concussion grenades, and other nonlethal weapons that were used on Sunday night. The assault on Sunday lasted approximately 6 hours long and injured about 160 people. Unicorn Riot, a volunteer-based media collective that was reporting live when the attack broke out, returned to the scene of the commotion on Monday morning to gather evidence. They found spent munitions shells with markings from Safariland and fragments of Stinger grenades, which police say were not used. They claim that injuries obtained by explosives on that fateful night must have been caused by explosives brought by other protesters. The user also tagged several accounts, including Unicorn Riot and the No DAPL account. Though moves like this may seem small, hours or even minutes of being offline can harm a business and even cause them to reconsider their involvement in this movement.